The proliferation and pervasiveness of new media and technologies in many U.S. young people’s daily life has reshaped their civic life experiences. Civic learning is now not only happening in offline environments but also online spaces. However, there is little research on the potential of new media for civic education. 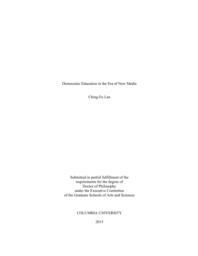 This study investigates young people’ learning experiences in new media civic education (NMCE) programs. The major research questions for this study are: How does new media civic education facilitate youth to address social issues? How can new media civic education foster youth civic identity? This study uses a qualitative collective-case study method to investigate two civic programs that integrated new media productions and address social issues: one program prepared students to learn about sustainability issues and to produce a series of virtual talk shows about sustainability issues in Second Life (a simulated world digital platform); the other program facilitated students’ production of radio stories about homeless youth. Findings from this study reveal that NMCE can help students navigate in a new media mediated world to learn about social issues, produce digital stories to raise awareness about these issues, and mobilize their interests for civic causes. In addition, students can develop authentic voices about social issues, exercise civic agency and reach out to real world audiences across the world to facilitate social change. Both cases in this study demonstrated a mix of success and failure in facilitating civic learning and civic identity development. Results from this study suggest NMCE programs adopt three distinct pedagogies: (1) pedagogies that embrace students’ cultural experiences to develop youth voices on social issues (e.g. the pedagogy of collegiality); (2) ones that facilitate examination of their emotions in manipulating what they perceive about social issues and the other (e.g. a pedagogy of discomfort); and (3) pedagogies that encourage mentorship and peer teaching/learning about digital production skills (e.g. studio mentorship model). Furthermore, it is necessary to consider not only the expression of youth voices, but also how these voices will be heard, what kinds of conversations might be sparked based on these digital works, and how students would respond to them. Thus, creating spaces of participation where students can meet people with diverse perspectives and have dialogues with them around social issues discussed in their digital productions is important for NMCE to prepare democratic citizens.